While on Earth, the planet protects us from space radiation and cosmic rays with its magnetic field. NASA scientists are now working on an analogous approach to protect spacecraft from space radiation outside of Earth’s protective envelope. Illustration of shielding with superconducting magnets (Credits: NASA/NIAC). NASA along with its partners is exploring the possibility of using superconducting magnets to generate magnetic fields around space probes and space habitats to protect them from space radiation and cosmic rays. The NASA Innovative Advanced Concepts program is funding this study on high temperature superconductor technology as an active radiation shielding. NASA JSC is performing this research along with Advanced Magnet Lab (AML), a Florida based company with expertise in superconducting magnets. The shield would use superconducting magnetic tape attached to flexible material like Kevlar. Current is passed through tape coils, resulting in a perpendicular expansion from Lorentz forces that would open it from collapsed configuration to large coils which surround the habitat. “In a superconducting magnet, because you’re able to transmit electricity with zero resistance, you can pass very high currents, which means very strong magnetic fields,” said Mark Senti, President of AML. 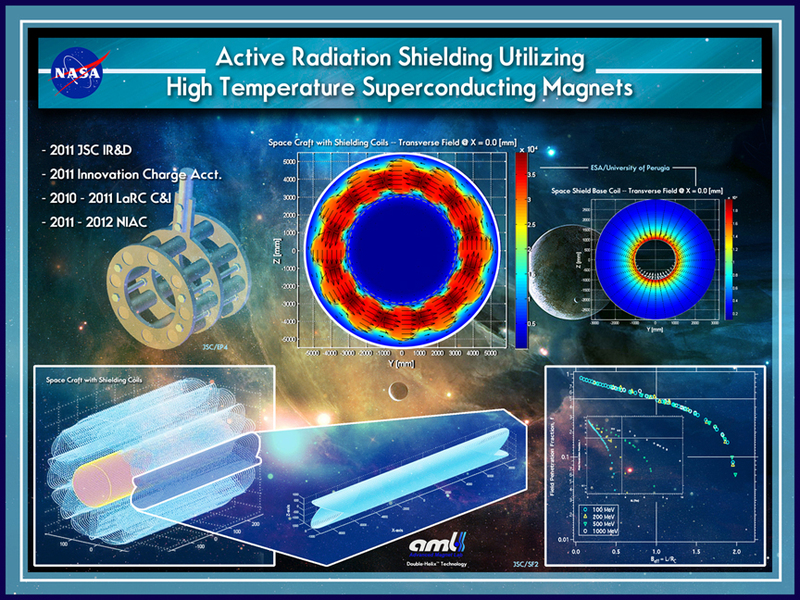 Magnetic shielding concept poster (Credits: NASA/NIAC). Further study is needed to determine the total radiation experienced inside the magnetic shield, said Westover. For a 6-meter-diameter, 10-meter-long cylindrical habitat. the shielding does not protect at the cylinder’s ends, but passive shielding from the propulsion system and docking mechanism might compensate for the gap in those regions. The exposure limits still need to be calculated. Although the concept seems promising, issues such as structure required to hold the coils, and the energy required for generating a magnetic field strong enough to protect the crew, are yet to be overcome. Space radiation has been a hurdle to long duration human space exploration almost since human spaceflight began. Research on superconducting magnets may help at last overcome this challenge. What about an electromagnetic field around a spacecraft to power it?? Doesn’t space have a gravity force known as Dark Matter?? Could the electromagnetic field use this Dark Matter some how??? I’m afraid not, Fritz; Dark Matter is so called because we can’t detect it (yet). 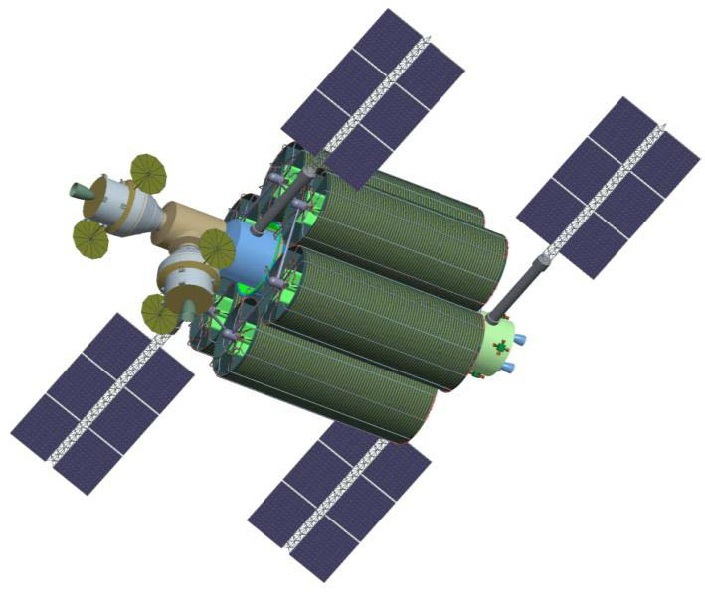 There is such a think as electric propulsion – it works by creating a directed flow of ions. It is rather slow but builds up over time and is therefore useful for long duration robotic missions. I liked your idea Fritz, it’s a shame that it isn’t possible yet. Here’s hoping for the future, though! If you have a magnetic shield around the spaceship wouldn’t the charge particles from the sun repel the spaceship also? like two same polarity side of a magnet? and maybe we wouldn’t need a rocket engine.